Perry – Handsome young leading man type. Hey who’s writing this, you or me? The Scene - Perry and Farbman are sitting at lunch. Farbman looks tense and unhappy, idly moving his fork around his plate. Farbman, I’ve never seen you so upset. You haven’t even touched your second dessert! I touched it. I can’t eat it, but I touched it. I haven’t seen you this upset since it was announced Jimmy Fallon was taking over The Tonight Show. It's my son Bruce. In all my days, I never thought something like this could ever happen! What is it, Farbman? Did he vote for Trump, forsake Judaism, listen to ABBA? If only it were one of those things! No, my son Bruce told me ... he told me ... he told me he doesn't like Tom Hanks! 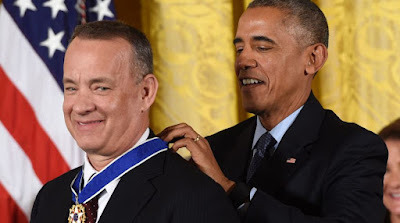 He told me he doesn’t like Tom Hanks! Pause. Farbman begins to weep. He … doesn’t …like … Tom Hanks? America's most likeable celebrity? The nicest guy in Hollywood, a welcome presence on screens both large and small? Farbman, how did this all come about? It was last Saturday night. I was watching Cast Away again and Bruce came into the den. Bruce, I said, Tom and Wilson the Soccer Ball are beginning to bond. It’s so beautiful! Come sit down and we’ll watch together. Uh, I’d rather not, Dad, he said. It's time I told you, he said. I don’t like Tom Hanks! What are you saying, Bruce?! I shouted. 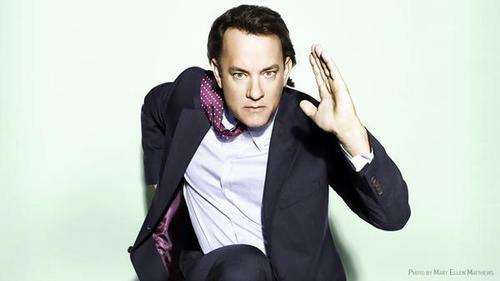 I’ve never liked Tom Hanks, he said. And I never will! Farbman, try to understand! Bruce has no choice in the matter. He was born not liking Tom Hanks. How could this happen to me? I who have seen Forrest Gump more times than Sally Field has popped Bonivas! Farbman! This isn’t about you! People’s attitudes are changing. It’s a more inclusive world now with room for everyone. Straight. Gay. LGBTQ. THD. Sure. I’ll bet in 10 years or so Tom Hanks Dislikers may even be able to marry each other. Perry, what should I do? Just tell Bruce you love him and support him no matter what. I think you’re right. I do feel better. Thank you! They shake hands and Farbman walks off. Poor guy. Poor, Poor guy! Yeah, sure, Bran. How about something with Tom Hanks? Great, Dad! Everybody likes Tom Hanks. Why don't we watch Sully? Um … I’d rather not, Dad. It's time I told you. I don’t like Sully Sullenberger!